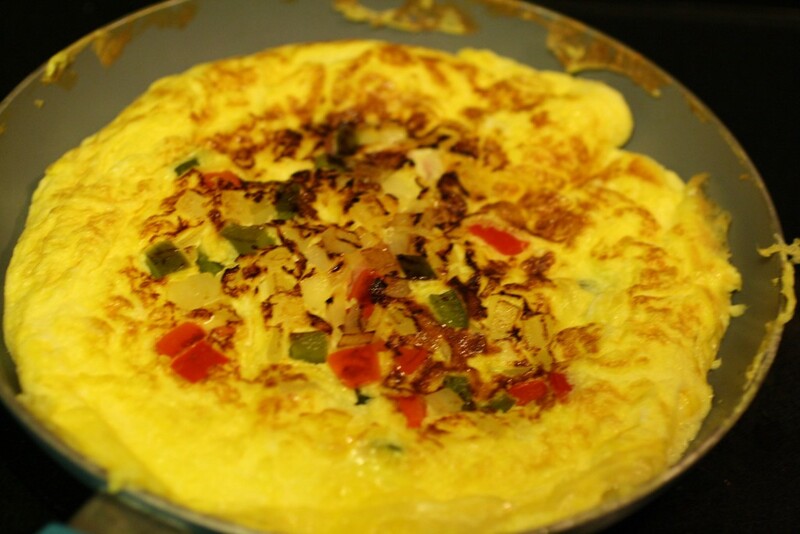 This Spanish Omelet is a more like a frittata, but is a wonderful breakfast option when you have a few extra minutes! I discovered the Spanish Omelet when I was in Spain. 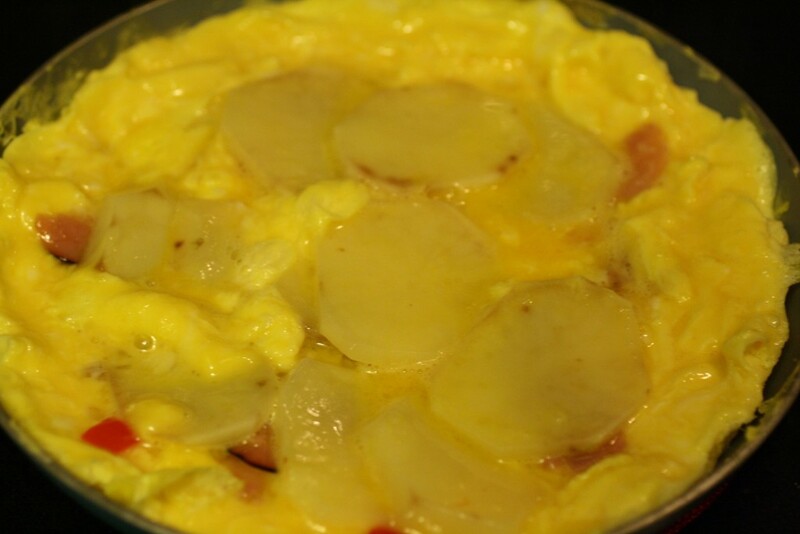 Their omelets are a bit more plain with eggs, onion, and potatoes. I like to have a little more color in my breakfast so I added in some red and green bell peppers and some ham! This recipe is great for 2 people and if you need to fix for more, simply double the recipe! The first thing I did was peel a red potato and cut it into thin slices. 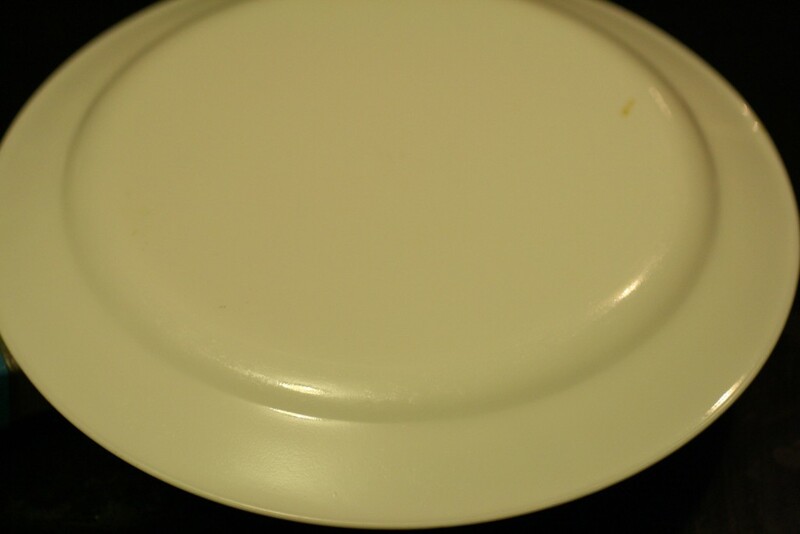 I placed the slices on a microwave safe plate and cooked in the microwave for 1 to 1 1/2 minutes. I then put about 2 Tbsp of butter in a frying pan and let that melt over medium-high heat. 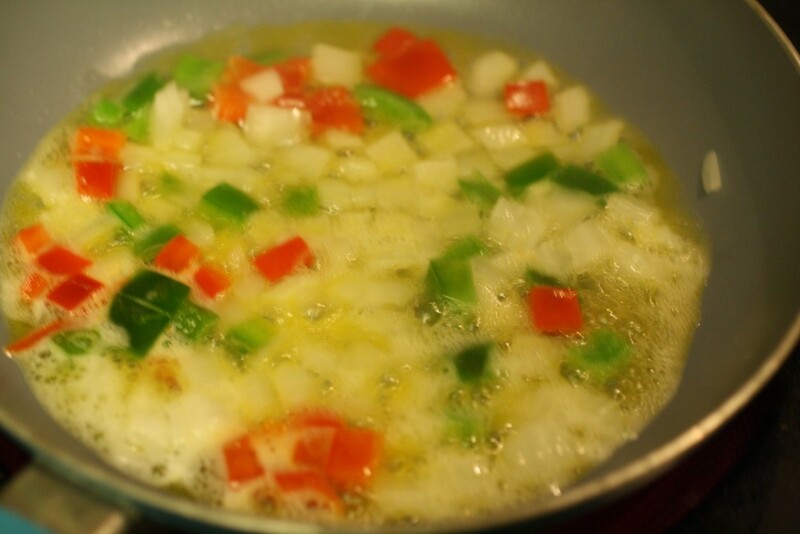 I added in the peppers, onions, and ham and let them cook for 2 minutes. 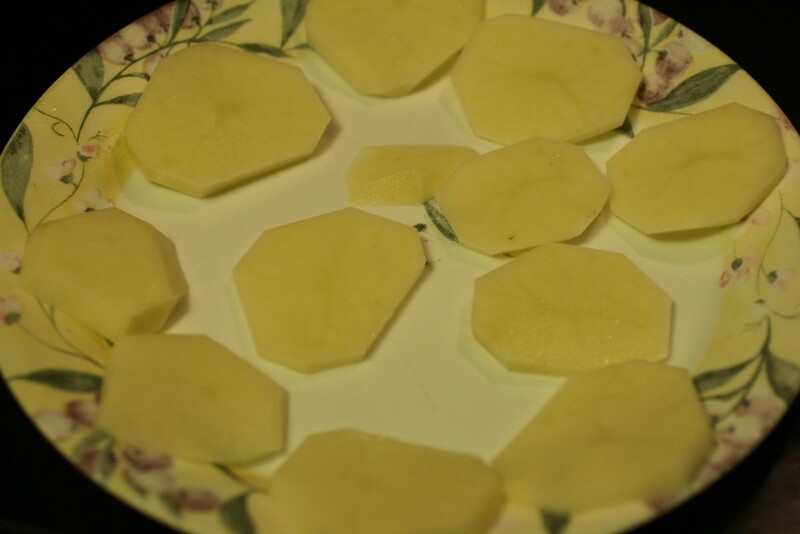 Layer the potato slices on top and cover the entire frying pan with the potatoes. 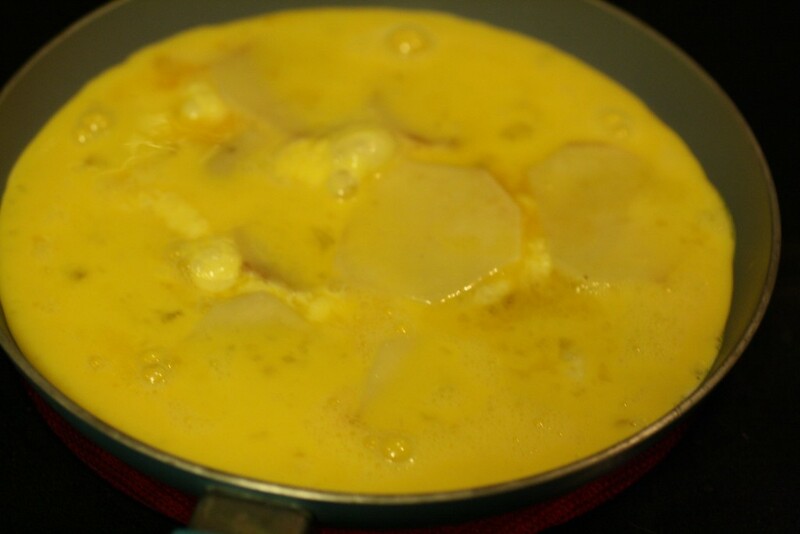 Then scramble 4 eggs with a splash of milk and pour in to the pan. You want to watch for the eggs to begin to set all around the pan. One thing I do to help the eggs set better is to take my spatula and push back the edges around the pan and roll liquid in underneath the pushed back edge. I go around the pan several times to get as much liquid off the top as possible and the eggs set before I turn the omelet over. Since this is a bit thicker than your average omelet, flipping isn’t really possible. What I learned was to take a plate and place over top of the frying pan and then turn it upside down to remove the omelet. Then slide it back in to the pan and fix any edges you need in order to make it flat and round again. Cook until the omelet appears set. I do tend to flip mine one to two more times to ensure my eggs are cooked all the way through. I use the plate each time since this is a thick omelet. Once the omelet is cooked through, slide on to a plate and let sit for a few minutes. Slice and serve! 1. Peel and slice the red potato. Place the slices on a microwave safe plate and cook for 1 to 1 1/2 minutes. 2. 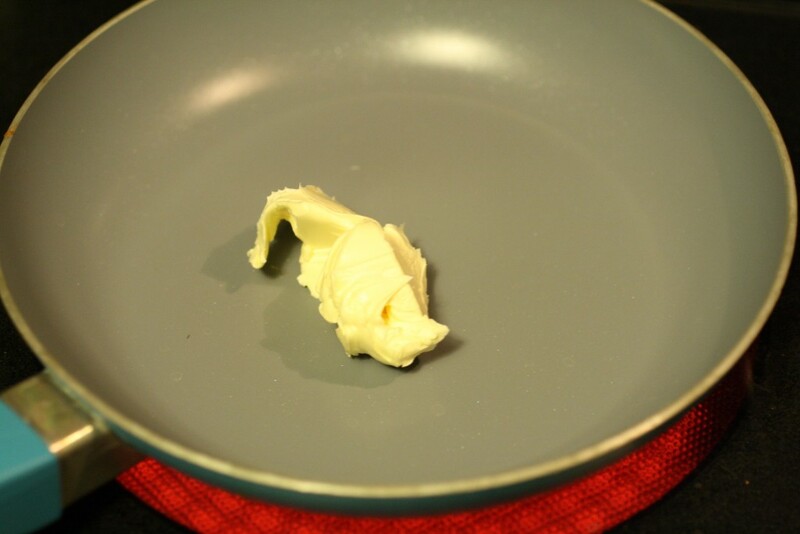 Heat 2 Tbsp of butter in a small frying pan over medium-high heat. 3. Add in the peppers, onion, and ham and cook for 2 minutes. 4. 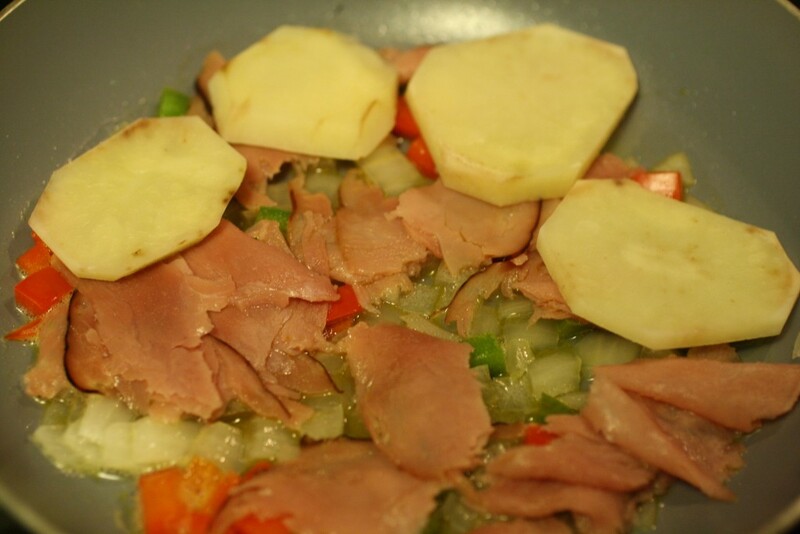 Layer the potato slices on top of the vegetable and ham mixture. 5. Scramble 4 eggs in a bowl with a splash of milk. Pour into the frying pan over top of the potatoes. 6. Cook until the eggs are beginning to set, in the middle in particular. Place a plate over top of the frying pan and turn the pan upside down to remove the omelet. Slide the omelet back into the pan and reshape as necessary. 7. Cook until the remaining eggs are set. Can flip another time or two to ensure eggs are cooked in the middle. 8. Remove the omelet from the pan and let sit for a few minutes, slice and serve! Yum! Im not a huge fan of eggs in general but this looks amazing!